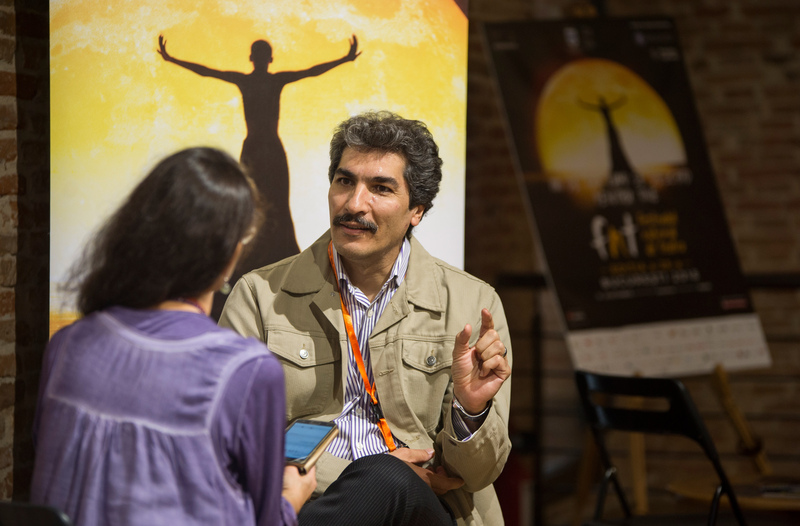 Among the foreign guests attending the Romanian National Theatre Festival this year has been a person actively involved in various aspects of the Iranian theatrical and cultural scene: Mehrdad Rayani-Makhsous. A playwright, theatre critic and university theatre lecturer, he is also the Director of International Relations at the Dramatic Arts Center in Iran. How was your experience of the Romanian NTF this year? I have seen some quite powerful performances at this festival in Bucharest, and over all the activities and performances at this year’s NTF are even better than last year. Also, from reading various articles about the Romanian theatre scene, I have noticed there is a constant development here in theatre, cinema and culture generally, people are keen to reach a constantly higher level. How do you see the current theatre life in Iran? In the last ten years there have been many developments in our theatre scene. There has been a boom of independent and private theatre. Before, all theatre activities were totally supported by the government. Nowadays, the number of independent theatre projects is increasing and even surpassing the state theatre ones. Also, the quality of the performances in the independent theatre is increasingly higher, we have a competition of the right kind there. At the moment we have 8 international theatre festivals in Iran, including 2 international independent theatre festivals, around 100 national theatre festivals all over Iran, and 14 big theatres. Also, we have 23 independent theatre centres in the country, 40 theatre university departments, 47 theatre publications. So things are happening and developing constantly. How do you see the relationship between this big boom of theatre culture and the development of society? Indeed there is a strong connection, and I am particularly interested in this topic, as a director and a playwright. For example, two months ago we had a performance on the topic of transgender, which in the Iranian society is undergoing multiple changes. Generally speaking, many people are keen to make a generation change in theatre as well as society. So yes, theatre can truly help society develop. Another area in which that happens in Iranian society are, for example, the drama/ theatre therapy projects, or the theatre projects for disabled people (we even have an international theatre festival for disabled people). How much need do you think there is still for theatre, as opposed to the desire of it as just an entertainment? I think the need for theatre is very real and substantial. Many years ago, people said that, because of the multimedia developments, theatre won’t survive and people will shift massively towards cinema or TV. But theatre proved it can survive and still be unique. While watching a theatre performance, something unique happens in your mind. The interaction between theatre and human being is irreplaceable, it simply cannot happen in other forms of art or media. That’s why there are still people who cannot leave theatre and must continue making it. Also, theatre offers a completely different kind , of connection and communication, and this is what makes individuals and also society ‘go up’ in an intellectual way. Many theatre professionals are keen to make productions that can connect with the mind of the audience, not just their.